performance of “two transmitters in one.” It transmits a 4 to 20 mA or digital output signal, as applicable, using FoxCom, HART, or FOUNDATION Fieldbus communication protocol for remote configuration, calibration, and monitoring. 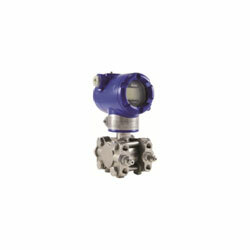 Multirange transmitters simplify planning, ordering, and spares procurement and stocking. Wide measurement spans from 0.12 to 250 kPa (0.5 to 1000 inH2O) using only two sensors, each having 400:1 turndown capability. Simple, elegant sensor packaging with very few parts achieves exceptionally high reliability. A selection of FoxCom, HART, or FOUNDATION Fieldbus Protocols for remote communication. Hastelloy C or Industry Standard 316L ss offered for sensor wetted parts materials.